Today we continue our Recommended Reads series, where we highlight books for children and young adults, with Out of the Dust by Karen Hesse, originally published in 1999 and now available from Scholastic Books. Plot: Billie Jo, a scrappy, spirited, thoughtful girl is the narrator of this powerful book. The story takes place in the dust bowl of Oklahoma during the Great Depression where Billie Jo and her parents try to eke a living out of the unforgiving land by growing wheat. When a terrible accident befalls Billie Jo and her mother, Billie Jo faces the loss of nearly all of the things she loves and must rise to the occasion. Readers will be delighted when, in the end, Billie Jo triumphs. Our Take: We can’t get enough of historical fiction – what a marvelous way to inspire students to care about people and events they couldn't otherwise experience! Hesse’s novel is told through a series of vignettes that take the form of free verse poetry and read like diary entries. This means that although the book seems thick, the print on the pages is sparse and will seem inviting to even reluctant readers. 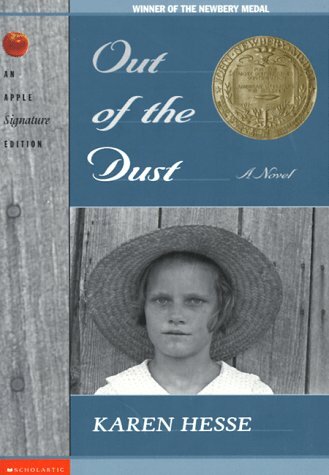 Billie Jo’s character is endearing, and her voice brings the desperation of the dust bowl to vivid life. In addition to suffering a slow recovery after her accident, Billie Jo faces the death of her mother, isolation from her ill and grieving father, a plague of locusts, loneliness when her best friend moves away, the possible loss of her gift for the piano, and, of course, continuous drifts of dust and drought that threaten to dry up her hope forever. But Billie Jo is made of sterner stuff, and her courage is all the more momentous for the hurdles she has to leap. Hesse’s language is vivid and easy to read, and she creates a cast of fascinating characters who help to present a rounded, readable portrait of life during one of the most difficult periods in United States history.